1. What is the Passport Challenge? Traveling Shoes: Black Migrations invites you to embark on a journey of discovery. Pick up a special passport at your local library and travel to each library location to learn about a different object representing the theme. Track your progress by receiving a unique stamp at each library. Anyone who is a resident of the United States and is not an employee of the Queens Library or an immediate family member or living in the same household as a Queens Library employee. All ages can participate and if the winner is under the age of 18, he or she must have a permission form signed by his or her guardian before receiving a prize. 3. How do I get a passport? Visit your local library to pick up a passport from a library staff member. 4. When is the Passport Challenge taking place? The Challenge takes place from February 1 to February 28, 2019. 5. What do I do with my passport? 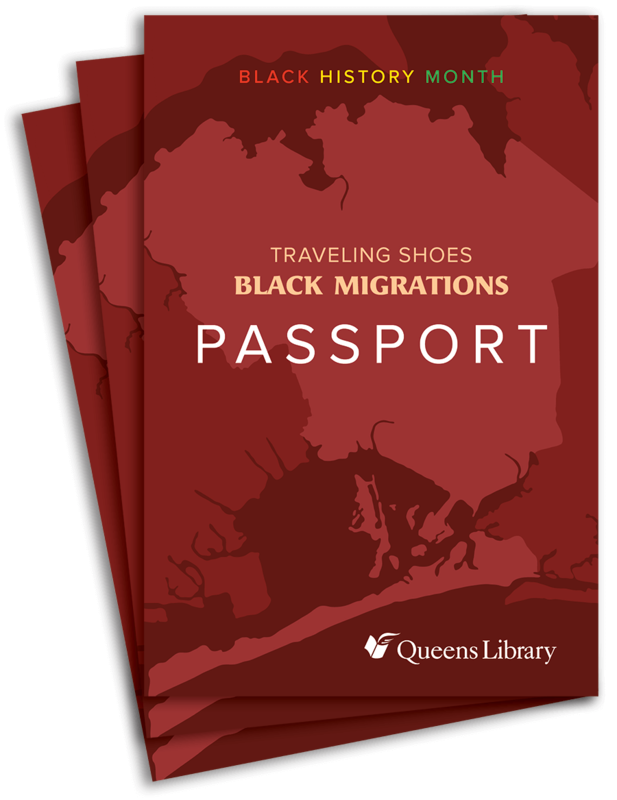 Bring your passport to each library location to obtain a unique stamp of the Black Migrations object depicted at the library. Collect as many stamps as possible! 6. What do I do with my passport when the Challenge ends? Turn in your passport with your collected stamps to a library staff member by Friday, March 8, 2019. Be sure to fill in the first page of your passport with the required contact information. 7. How do I win the Passport Challenge? Three contestants who have the most stamps will be selected as the winners of the challenge. Any ties will be decided by a random drawing of the eligible contestants. 8. How will I know if I win the Challenge? Winners will be notified by email on or about March 26, 2019. In circumstances when winners do not have an email address, we will contact them by phone if provided. 9. What can I win? The winners will each receive a $50 gift card to Modell’s Sporting Goods, three books selected by the Library that are related to the theme of Black Migrations, and a Queens Library 22” Samsonite wheeled duffel bag. 10. Can I get my passport back? Yes, check the box on the first page of the passport if you would like your passport returned. Be sure to include your full mailing address so that we can send it to you.